The Mission Morning Mix. Get excited! 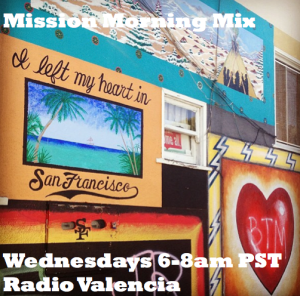 Elizabeth here and I’m super excited about my new show – The Mission Morning Mix. Tune in Wednesdays from 6-8am PST. Yes, I know it’s early. All you have to do is turn on the radio or listen to Radio Valencia’s online stream, I’ll do the rest. Text in your requests to 415-367-4679.